Angelato not exactly a hidden gem. Witness the insufferably long lines in front of the Rytirska and the Ujezd locations... on a good day. Our favorite is still the mango sorbet, although it's been fun trying their seasonal extras, although not all of them are winners. We tend to stop more often in their Ujezd location near the bottom station of the Petrin funicular, which is really nice, has more room to hang out in and the lines are somewhat shorter. For those intolerant to lactose, Angelato offers sorbets. Plus they also have gluten-free cones for those who care. (Looking at you, Gwyneth!) Cheapo tip of the day: Go for the girl behind the counter in the Ujezd location. She’s not shy to give big tasting portions. You’re welcome. 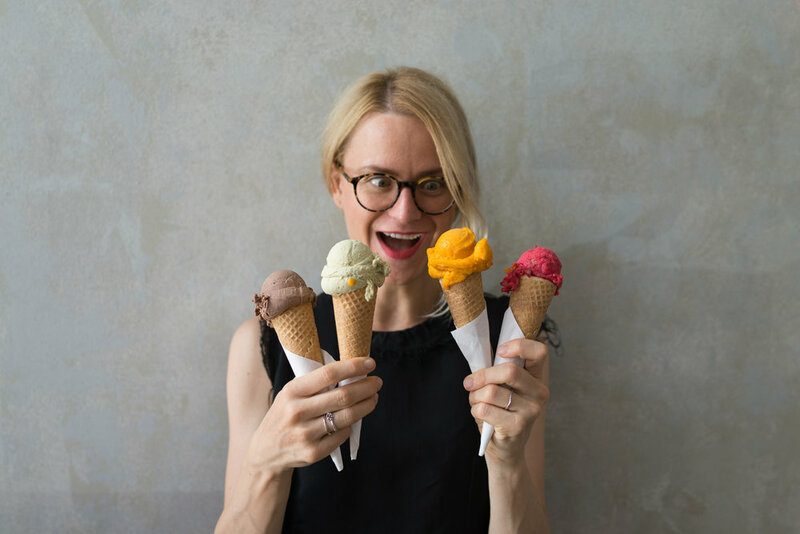 This ice-cream powerhouse - and our favorite ice-cream in Prague - is seated in Kacice, a tiny village just a mile off the main road from Prague to the Carlsbad spa, but the shop attracts ice-cream addicts from near and afar. But you don’t really have to leave the town if you want to try a scoop: 2AD delivers to many great Prague coffee shops. Their standard is high for most ice-creams, but we keep coming back for the luscious, wonderful pistachio. Their rowanberry is wicked, too. Never had rowanberry? Well, there just may be a hole in you that you never new about and only rowanbery ice-cream can fill it. Where to have it? 2AD ice-cream is served in some our favorite cafes in town: EMA Espresso Bar, Kavarna Místo, or Muj salek kavy, and in other cafes like Novy svet or Alza. But you don’t need to go through a caffeine-rich run around the town to get a taste of different 2AD flavours. Just visit Zmrzlinar. The shop opened in Prague's Vinohrady district with a bang and a fresh marketing campaign earlier this year, and appealed to the wider public with a wide array of 2AD ice-cream and a minimalist aesthetic (think bare concrete and a nearly non-existent color scheme but, sadly, air-conditioning was forgotten somewhere in the design process, so the interiors are insufferably hot on a hot day. A horrible omission… or a strategy to sell more ice-cream?). Nevertheless, we do love that place: it’s simple, serves probably the widest assortment of 2AD ice-cream in town, is devoid of any mass tourism, and the ice-cream-against-bare-concrete is a great Instagram shot. A must for an ice-cream aficionado in Prague. Their scoops are on smaller side, but for those who cannot make up their mind (yes, ahem, we’re looking at you), Zmrzlinar offers a tasting bowl with five flavors. Puro Gelato occupies a great little corner shop near the Vyton tram stop underneath the Vysehrad fortress near the Naplavka farmers market, and another one in the Kaprova street in the Old Town. These places are very popular and the service is generally very nice, but the different flavors have been a hit or miss affair for us: we really liked the blueberry with sour cream, the banana, the poppyseed, the ricotta with figs was okay, and we’d skip the salted caramel and carrot gelato the next time we’re there. We generally prefer their sorbets to their gelato. But that’s truly beside the point here: just get a flavor you like, and sit down in the shady side street in front of the shop, or take it on a stroll through Prague’s Old Town, and you’ll be happy. A nice place in the beautiful and cool Letna district that has a nice neighborly feel to it. They make their own ice-creams from scratch, and sometimes offer interesting flavor combinations. We like some of the flavors less than others, so please make sure you will taste them all before you order. That said, the texture is right and the flavors are nice, if not always precise. A great after-dinner snack if you’ve had our favorite sliders at Mr Hot Dog just down the road. Part of our Prague food tours on a particularly hot day, Parlor in the Karlin district (not to be confused with Parlour, our favourite cocktail bar in Prague) satisfies on soooo many levels and, in a way, is the perfect place for a big family outing. Just think about it: ice-cream sandwiches… and gin and tonics. What else would you want on a hot day? Exactly. The ice-creams are customised creations by Creme de la Creme, which is a good thing. The cookies are a bit on the crumbly rather than the chewy side, but that’s okay. Just sit down in the very floral, shady and relaxed room, get an ice-cream sandwich and a g&t. Enjoy the moment. Repeat. You’re welcome. Sure, one may argue we push onesip coffee in every post. And they would be right. One of our favourite coffee shops in Prague is a place close to our hearts in more than one way, and on a hot day, they deliver, too. Jan opts for the "First Kiss", a scoop of cold ice-cream, a shot of delicious espresso, and a small shot of rum. (To be historically accurate as a first kiss for Jan, you’d have to triple the shot, and add a healthy dose of awkward.) Zuzi likes the iced popsicles by Fruteama. They are artisanal, small-batch, vegan and all the other things young people like today. Zuzi swears by the strawberry. There’s more to life than McDonald’s if you crave sinful soft-serve. Triko Kafe & Kolonial, a little bistro just above the Smichov district opened by Michal, the owner of Tribo, a famous tattoo parlor, serves some pretty nice soft-serve, too. The owner, has been playing with recipes from David Leibovitz’s book of ice-creams, translating them into the soft-serve form, and he’s been mostly successful. Heck, he served his poppy seed and plum soft serve with a healthy dose of Slivovitz, a plum brandy, on Zuzi and Jan’s wedding party for a reason. 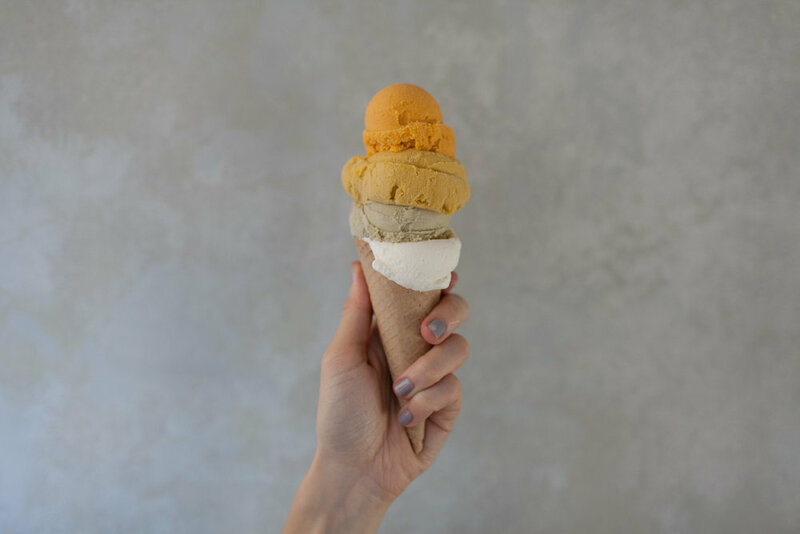 So if you find yourself underneath the Malvazinky hill (perhaps on your way to see Lenka, the owner/designer of the fantastic 27 Jewelry studio), sweeten your stroll with a bit of soft-serve. If you’re in for an ice-cream treat in Prague - and perhaps a bit of buzz - ice-cream parlors are not your only option. Virtually all great cafes in Prague offer an affogato: a scoop of ice-cream with a shot of espresso. These range from the standard plain ice-cream to more adventurous options: if you haven’t tried Hazelnut ice-cream (the peanut well do, too) affogato and like Nutella, this could be your summer treat game-changer (they sometimes have it in Kavarna Místo). Ask your favorite Prague barista for more details. Misa ice-cream has been a staple of Czech supermarkets for decades. It has a very specific, slightly acidic taste due to the fact that the ice-cream is not made of cream but of a combination of cream and farmer's cheese. The whole thing is then covered in chocolate. The recipe for the bar has not changed since the product was first unveiled in 1962. Jan is not a fan, for instance, but Zuzi likes the ice-cream bar (because it’s not so sweet) and it is the one unique ice-cream money can buy here in Prague. If you want to explore different tastes, this is what you are looking for.